Dust off the vehicle body after you drive. Regularly inspect your vehicle for scratches on painted surfaces. A scratch on a painted surface can result in body rust. If you find a scratch, promptly repair it. • If driving on roads with road salt. • If driving in coastal areas. • If tar, soot, bird droppings, insects, or tree sap are stuck to painted surfaces. 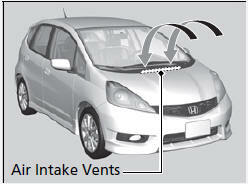 Do not spray water into the air intake vents or engine compartment. It can cause a malfunction. • Remove the audio antenna. • Fold in the door mirrors. Make sure to follow the instructions indicated on the automated vehicle wash.
• Keep sufficient distance between the cleaning nozzle and the vehicle body. A good coat of automotive body wax helps protect your vehicle’s paint from the elements. Wax will wear off over time and expose your vehicle’s paint to the elements, so reapply as necessary. Chemical solvents and strong cleaners can damage the paint, metal, and plastic on your vehicle. Wipe up spills immediately. If you get gasoline, oil, engine coolant, or battery fluid on resin coated parts, they may be stained or the coating may peel. Promptly wipe it away using a soft cloth and clean water. Ask a dealer about the correct coating material when you want to repair the painted surface of the parts made of resin. Wipe using a glass cleaner. Wires are mounted to the inside of the rear window. Wipe along the same direction as the wires with a soft cloth so as not to damage them. Aluminum is susceptible to deterioration caused by salt and other road contaminants. Use a sponge and mild detergent to wipe away promptly. Be careful not to use harsh chemicals (including some commercial wheel cleaners) or a stiff brush. They can damage the clear coat of the aluminum alloy wheels that helps keep the aluminum from corroding and tarnishing.